Papaya is a very sweet and flavorful fruit available all through year. 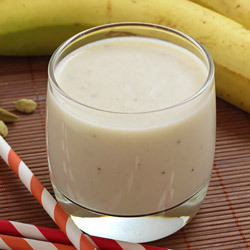 Since it has smooth and mellow texture, smoothie made from it is a silky delight to palate. Apart from ripe papaya, this recipe also uses frozen banana, low fat milk and vanilla yogurt which provides complimenting flavor and texture. Blend papaya, banana, milk, yogurt, sugar and crushed ice in a blender or food processor until smooth puree. Check thickness of the slushy drink. If required, add additional milk to reduce the thickness and blend again for 15 seconds. Pour it in chilled serving glasses and serve. 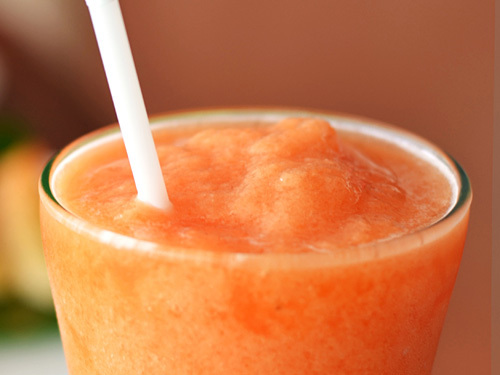 Choose ripe papaya to enhance the natural sweet flavor of smoothie. Replace milk with orange juice or pineapple juice or soymilk to get different flavors. You can use honey, agave nectar or any other artificial sweetener in place of sugar. Taste: Sweet and silky creamy flavor of papaya with mild hint of banana and milk. Serving Ideas: Serve it as a party dessert or as an afternoon beverage during summer days.